The faces Simone Biles shared the podium with at the 2016 Olympics are gone. And yet the machine rolls on. Relaxed, relieved and with the gold medal the U.S. women’s gymnastics team flew halfway across the globe for secured, Morgan Hurd needed a break. So the 17-year-old hopped on the back of Simone Biles and went for a brief ride, the two teammates laughing all the way. While the scene lent itself to an easy metaphor, that’s not the reality. Sure, having the best gymnast on the planet tends to help while putting together a dynasty. Except the United States’ dominance in the sport _ one that shows no signs of ending after the Americans won the world championship by a record 8.766 points on Tuesday _ goes far deeper than its 21-year-old superstar. It’s 15-year-old Kara Eaker gracefully drilling her balance beam routine in her first major international meet. It’s 17-year-old Riley McCusker proving high performance coordinator Tom Forster’s hunch correct by being rock steady on beam after a shaking performance in qualifying. It’s Grace McCallum celebrating her 16th birthday by coming through on floor and vault. It’s Hurd posting top-five scores on vault and uneven bars on a day the U.S. put up the top overall scores by at least a full point in each of the four events. The U.S. put up a total of 171.629 to win its fourth straight world title and secure a spot at the 2020 Olympics. Silver medalist Russia and bronze medalist China also locked up Olympic berths by reaching the podium during a taut but occasionally sloppy final that showcased increased parity in the sport, at least for the teams that don’t have the stars-and-stripes on their leotards. The gap between Russia and eighth-place Germany was all of 3.43 points, less than half of the margin between first and second. The Russians didn’t lock up silver until the final routine on the final rotation. By then, gold was already well in hand for the Americans, just as it has been since their winning streak began seven years ago. Not bad for a group that Biles said had a terrible warmup session before making its way into the half-filled Aspire Dome. Then the lights came on and the U.S. did what it has done in all four hemispheres of the planet _ from Tokyo to London to China to Brazil _ for the better part of a decade: It made the impossibly difficult look remarkably easy. 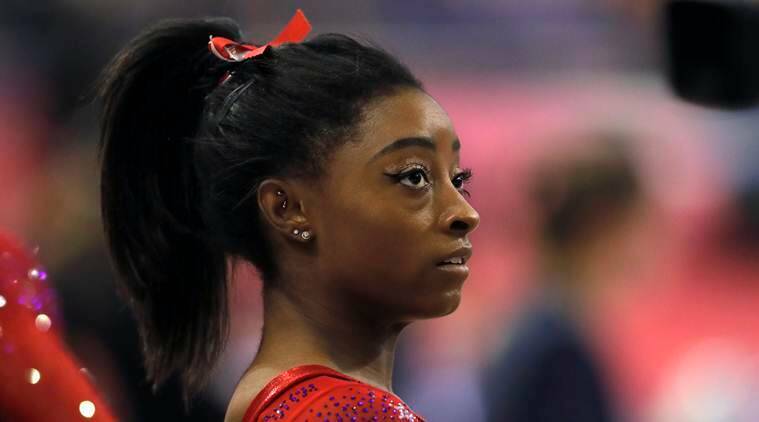 The Americans weren’t perfect, even Biles. She looked downright angry after a beam routine in which she briefly lost her balance while trying to land a front pike, forcing her to reach down and hold on. She later stepped out of bounds during her first tumbling pass on floor exercise, a byproduct of her explosive power. Yet they’re mistakes Biles and the rest of the U.S. can absorb without fear of getting caught. It’s simple math. The Americans put together the toughest routines and then do them cleaner than everyone else. It’s why Forster can afford to put McCusker on beam over Hurd in the final even though Hurd scored higher during qualifying. Even if McCusker had imploded, the team still would have been fine. Only she didn’t. Her score of 13.7 on Tuesday was markedly better and the boost to her confidence immeasurable. So she did. And that’s kind of what Forster was going for. Tasked with helping create a more positive culture within the organization, Forster wanted to send a message to the rest of the elite program by giving McCusker another opportunity. Forster, hired in June, joked he’s finally going to get a chance to sleep through the night. The same goes for the team, though the Americans will be plenty busy over the next few days. Three of the five women will be in at least one event final. Biles, nearly a year removed since she returned to training, will have the heaviest workload of all. She’ll be in the all-around final and all four event finals. Medals in each _ Biles finished first in qualifying in everything but bars, where she was second _ would give her 20 in her career at world championships, tying the record for most ever. After that she might take a breath, though she has no plans to coast until the 2020 Tokyo Games. Neither do her teammates. “Definitely not slack off,” she said. “But it’ll definitely put our minds at ease.” While the rest of the world remains on notice.